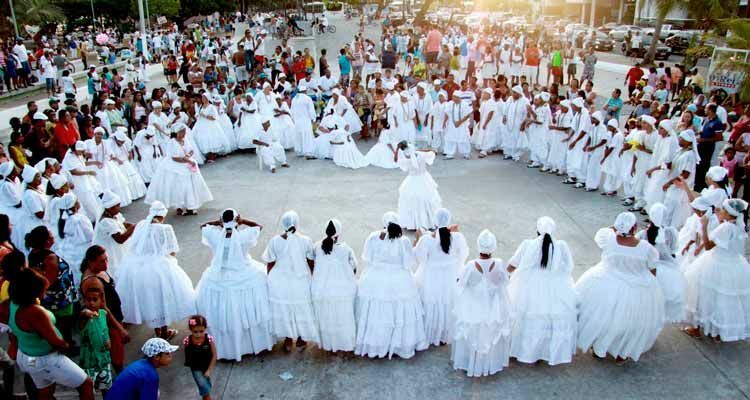 Candomblé is a religion based on African beliefs which is particularly popular in Brazil. It is also practised in other countries, and has as many as two million followers. The religion is a mixture of traditional Yoruba, Fon and Bantu beliefs which originated from different regions in Africa. It has also incorporated some aspects of the Catholic faith over time. A religion which combines elements of many religions is called a syncretic religion. The name Candomblé means ‘dance in honour of the gods’. Music and dance are important parts of Candomblé ceremonies. Specially choreographed dances are performed by worshippers to enable them to become possessed by the orixas.